Not manga-related, but I wanted to share some news that I haven't seen on other comics blogs yet. 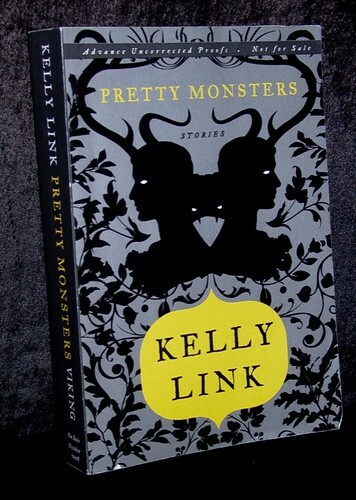 Kelly Link, one of my absolute favorite contemporary authors, has a new collection of short stories coming out this fall called Pretty Monsters. Along with a rad cover, it turns out that her book will be illustrated by Shaun Tan, author of the wordless graphic novel The Arrival! Kelly Link writes exciting and strange stories that chop up stupid genre demarcations (Young Adult, Horror, Slipstream) and smoosh them into a refreshing balm of awesomeness. While her writing is slightly outside of what I usually post about on Same Hat, I can't recommend it highly enough-- I think some of you guys would really, really dig it (if you aren't already fan). 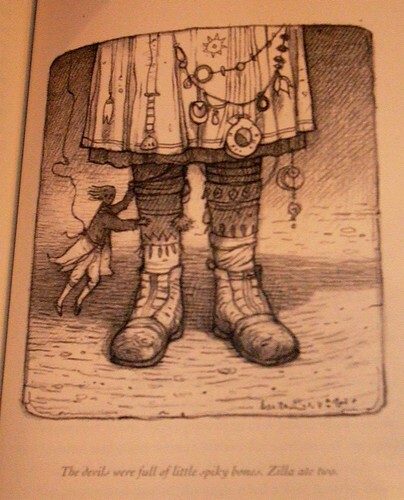 She makes a lot of her work available online via Creative Commons, and I strongly recommend starting out with either he new story The Wrong Grave [excerpt] or Monster [audio]. More free stories (text and audio) can be found on LCRW, home of Small Beer Press, the press run by Kelly and her partner, editor/writer Gavin Grant. Interior illustration by Shaun Tan for Kelly's Link's story "The Constable of Abal"
I was already psyched to read this book, but now that I hear we get the added bonus of super-draftsman Shaun Tan's illustrations, I wanna stare at it too. Check this out in bookstores in October. Kelly Link gave a guest lecture at one of my college classes actually. Gotta love Western Mass. I find a lot of slipstream/new fabulist or whatever writers a little bit too politically correct granola slash fanfic yuppie type, but she does some good stuff...Lady Churchill's Rosebud Wristlet is a good read. @jogs6000: Yeah, I actually printed out a story last week (in big font) and read it while running on a treadmill. I don't usually exercise, as evidence by this retarded idea, but it actually made the jog less painful. I have a feeling this new book is going to be fantastic! @anonymous: Kelly does great readings and she's extremely nice in person too. I dig LCRW too, and not just because my girlfriend had a story published there.